But we can enjoy the moment. Here are some international reviews below. And the some highlights from Saturday’s matches are here on Universal Sports (5+ mins). Robert Kitson in the Guardian: Pure black magic. The record books will show the cruel beauty of this nine-try exhibition. This was attacking rugby par excellence, performed by a side who prefer the stiletto to the lead piping. Matt Lawton in the London Daily Mail: To the irrepressible, irresistible All Blacks a masterclass in international rugby. When New Zealand play like this nobody can live with them. It is rugby from a different world. Rugby on a different level. Rugby played with more speed, flair and ferocity than any other side can manage. My word this lot are good. Rob Bartlett on ESPNscrum.com: This wasn't just a destruction, it was a brutal obliteration of Philippe Saint-Andre's side in front of a shellshocked Millennium Stadium. Rick Broadbent in the Times of London: Where to start? Nine tries executed at exhilarating pace; Dan Carter playing with a sort of sublime dexterity that made a mockery of recent muttering about his form; Julian Savea scoring a hat-trick to make it 38 tries in 39 internationals, wrapped up into a team performance that should make World Cup survivors feel very afraid. It was the biggest World Cup quarter-final win ever. On a night of rare skill and entertainment, at a stage when games are supposed to get tight, cagey and one-dimensional, New Zealand looked like the team of 2015. Paul Cully in the Sydney Morning Herald: So now we know where the All Blacks have been in this tournament. Quietly building behind closed doors, happy to let the others take the praise. Not any longer. Their dismantling of a shell-shocked France has changed the conversation in this World Cup. Now the talk will be just who is capable of stopping them. Chris Dutton in the Sydney Morning Herald: New Zealand are the kings of this tournament and the team to beat. They were simply outstanding. Masterclass. They showed tonight they are definitely the team to beat and favourites to make it back to back World Cups. Iain Spragg in the London Daily Telegraph: The intensity and the handling skills displayed by the Kiwis was incredible. That was absolutely ruthless and beautiful at the same. Ben Dirs on BBC.com: The performance of Steve Hansen's side was undoubtedly the most impressive of the tournament so far. Dan Lucas in the Guardian: That was terrifying. As good as I've seen from the All Blacks in a long time. That was sensational stuff: they started at a tempo unlike any we've seen in this World Cup. 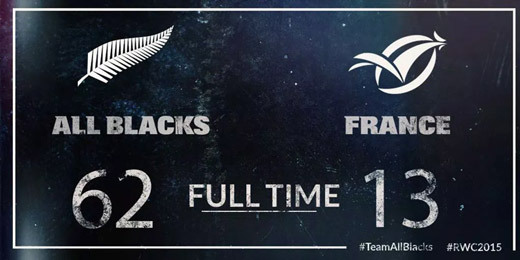 France were blown away, run down, torn apart and from then on it was far, far too easy for New Zealand.